Does anyone at your Thanksgiving dinner table get visibly excited over root vegetables? I've eaten a lot of Thanksgiving dinners, and I've never heard anyone exclaim, "Ooh, look! Roasted rutabagas! My favorite!" We know potatoes and usually love them. We know beets and usually hate them. But many of other root vegetables remain a mystery. Do you know the difference between rutabagas and turnips? (If you don't, read this post.) How about parsnips? Are you familiar with those? Here's what I want you to do for this Thanksgiving dinner: Buy an assortment of root vegetables, including the enigmatic turnips and rutabagas. Roast them with a little olive oil, salt and pepper until they release their sugars and caramelize. Then drizzle them with pomegranate molasses, a uniquely tangy syrup made from pomegranate juice and sugar. Serve them to your guests, but don't tell them about the pomegranate molasses. Then wait for someone to say, "Wow! These are delicious. May I have some more?" 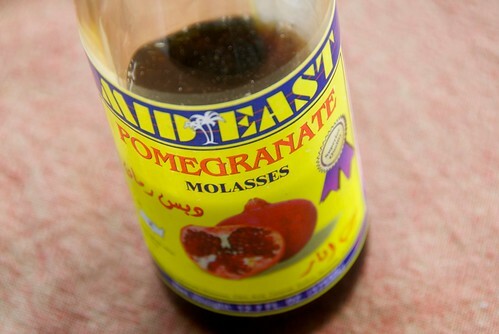 Pomegranate molasses is most commonly found in Middle Eastern specialty stores. You can also buy it online. If you can't find any, then you can make your own pomegranate molasses. Elise of Simply Recipes shows you how. 1. Preheat oven to 400 degrees F. In a medium bowl, toss diced vegetables with olive oil, salt, and pepper. Spread vegetables in a single layer on an aluminum lined baking sheet (for easy clean up). Roast for 20 minutes. Stir and continue roasting for another 20 minutes. Remove from oven. 2. Drizzle pomegranate molasses over the vegetables, and stir until well coated. Sprinkle with 2 teaspoons rosemary and stir gently. Roast for another 15-20 minutes or until vegetables are tender when pierced with a fork. Taste. Season with salt and pepper if desired. Toss in 3 tablespoons pomegranate arils and stir gently. Transfer to a serving bowl. Garnish with remaining teaspoon of chopped fresh rosemary and remaining 1 tablespoon pomegranate arils before serving. I do like root vegetables. Well, not all of them. Like you, i don't like beets. The rest of them are fair game though! This dish looks great. The addition of pomegranate molasses is a nice touch. Root vegetables are always on the menu. I like your version using the pomegranate. Sounds delish. Roasting is so awesome for adding flavor to just about any veggie. The molasses sounds like a nice addition. I just tried roasting broccoli with amazing results. I love a good root roast! Yours looks great for Thanksgiving. Everything tastes better with pomegranate molasses. I'm so glad I lived down the block from a Syrian grocery for many years in Boston; that's where I discovered many new flavors, including this one. Haha I am definitely the only person at thanksgiving who goes wild over rutabaga but that's because I'm slightly odd and have a definitely unnatural obsession with root veggies. I love the idea of having the tart and tangy molasses spruce up the blander veggies. Delicious. How come everything Joanne loves, I do too? I guess I'm not the only oddball rutabaga lover. This is such a great idea, I was totally trying to figure out some good ways to use my pom molasses. courtney-Pom molasses are definitely worth seeking out. The flavor is unique. mkitr-I'm glad to hear it! sues-I have made it twice already and know I'll be making it more! susie-Roasting really brings out the veggie's natural sugars. So delicious! lydia-It sounds like you lived in a fabulous culinary area in Boston. You must miss it. norma-Pom party? Ooh, that sounds like fun! This looks so good! 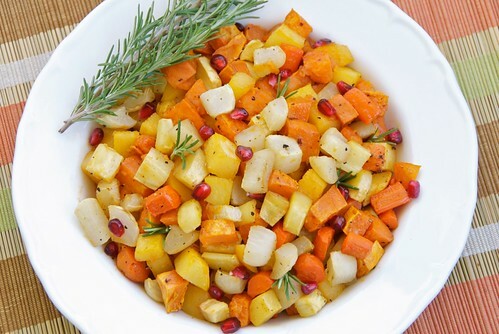 We always have a big plate of roasted veggies as a side dish on Thanskgiving; usually we use the ones you listed here minus sweet potatoes (those are their own dish!) and we add cippolini onions and baby patty pan squash for color. I love the pomegranate addition! Ooh, may I have some more? These look gorgeous! This sounds delicious! I will definitely be trying this recipe. I love roasted veggies and ahve them often, but I have not tried them with pomegranate molasses.